A former deputy governor of Nigeria's central bank and former senior UN official Wednesday announced his intention to contest the Nigerian presidency in 2019. 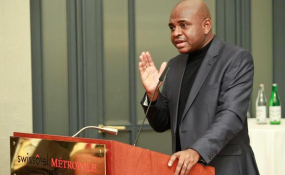 Kingsley Moghalu said he was moved to contest because of the "successive leadership failures of our civilian political class." "With love for our country and a fierce commitment to a vision of rapid progress for our more than 180 million citizens, and following wide-ranging consultations, I offer myself to serve you as President of the Federal Republic of Nigeria as from May 29, 2019," Moghalu said at a press conference in Abuja. He did not state on which party's platform he will be standing for election. He said: "We must refuse to allow the political elite to continue to intimidate us with the idea that no one can displace them. They boast they will outspend us and more. "But we say to them: Nigerians will not be taken for a ride yet again." As the deputy governor of the Central Bank of Nigeria from 2009 to 2014, Moghalu led the execution of extensive reforms in the country's banking system after the global financial crisis.